The following links will let you download files from past presentations. If you are attending the Variable Flow Chilled Water Plant Workshop I am leading this year, then you will find the materials you will need for the class session here on the weekend before the session if not sooner. Follow up materials will also be posted here. Years ago, after doing my very first load calculation (which was a manual effort based on a myriad of tables, charts and equations back in those days) I found myself sitting across the desk from Bill Coad as he reviewed the results of my efforts. After looking things over and asking a few questions, Bill said something that total baffled me until he explained himself. Nice job David; that’s the most useful, meaningless, piece if information we will develop for this project. How can something be useful and meaningless at the same time I found myself wondering? Sensing my confusion, Bill went on to explain what he meant. Specifically, he explained that we would be using the design load I had just calculated to select the various pieces of equipment for the project. And that single number would also set the size of the distribution systems the machines would serve as well as the size of the utility systems serving the machinery. And financially, all of those things would eventually set the project budget. Thus, getting the design load right was critical to success in all of those areas. we are hanging our hat on. Thus began my fascination with load profiles and part load efficiency and performance. And what I hope to do in this class is share some of that fascination with you, along with the lessons Bill and other mentors (including machinery and buildings) have taught me. Commissioning is a process during which buildings mentor us about our designs. Part of the plan is to work a tour of the central chilled water plant serving the conference location this year, none other than the 10,000 ton plant serving the Gaylord Opryland Resort & Convention Center. The idea is to spend some time ahead of the tour sharing ideas about what drives a load profile for a chilled water plant and how the machinery typically found in a central plant responds to those drivers so that by the time we go into the plant, you will be "primed" to see it in a different way. I actually won't get to see the plant myself until the Friday before the conference and as a result, the agenda for the class is still in a bit of a state of flux. But having said that, here is what I think we will cover over the course of the day; basically, my working agenda for the class. I'm hoping to make the class fairly interactive, including potentially working with you in Excel to illustrate basic techniques that you might find useful for doing an assessment of a plant. So, while you don't absolutely need to have a laptop or Excel skills for the class, you may find it helpful to bring your laptop if you want to work along. And don't let a lack of Excel skills scare you off. Part of how you learn to do things with Excel is by trying it and we plan to have a few "floaters" in the room who can jump in if you are not quite following. Plus, we will encourage you to work in teams for the exercises so you can always team up with an Excel savvy neighbor and work on things together. You may even want to line such a partnership up ahead of time. In terms of other things you might want to do to get ready, time permitting, here are some suggestions. Since part of the "trick" in working with load profiles is understanding the machinery that is doing the work, you may want to "bone up" on pumps, chillers, and the other items mentioned in the Chilled Water Plant Machinery bullet above. One resource that you might find helpful in that regard is the Resource List we provide here on the website. Its fairly well bookmarked and you will find quite a few relevant resources under the Centrifugal Machines and Refrigeration and Cooling Equipment topics. You will also find some information on induction motors on the Induction Motor Principles page of this web site. I also help support day long classes at the Pacific Energy Center on topics like Pumps and Piping, Chilled and Condenser Water Systems, and Variable Speed Drive. All of the materials from those classes can be found on the Pacific Energy Center Classes page of this website. And I will sometimes reference common HVAC equations for energy and load (yes, there is math involved). I have been building web pages for the more common formulas like the square law and the equation for pump power and energy. So you may want to reference them before or after the class. There is also a page with a PowerPoint I use that has most of the common equations in it along with a number of other useful HVAC relationships and concepts. But even if all you did was show up for the class with an open mind and some curiosity, I would like to think you would benefit from it. If nothing else, you will get to see a really big chilled water plant, something most folks in our line of work would find to be quite informative and enjoyable. So, bottom line, as I finalize the content for the class, I will be posting it here, starting on Saturday some time and continuing through the weekend as I get all the i's dotted and the t's crossed. So, if you are taking the class, you probably will want to check back here every-once-in-a-while, or at least on Monday morning before heading down to the class room to pickup the content. I will also post follow-up materials here after the class. These are the materials for the class tomorrow. There are a lot of files; some of which are somewhat large. Don't panic; stay calm and continue to breath normally. There are a lot of resources included in this. Truth be told, I think you will do just fine if you come to the class and just watch what I do and participate in the lab session, perhaps occasionally partnering up with your neighbor when I am doing something in Excel interactively. But, based on past experience, quite a few people find the details useful, thus I have included them. See you in the morning; the plant we will visit is "way cool". 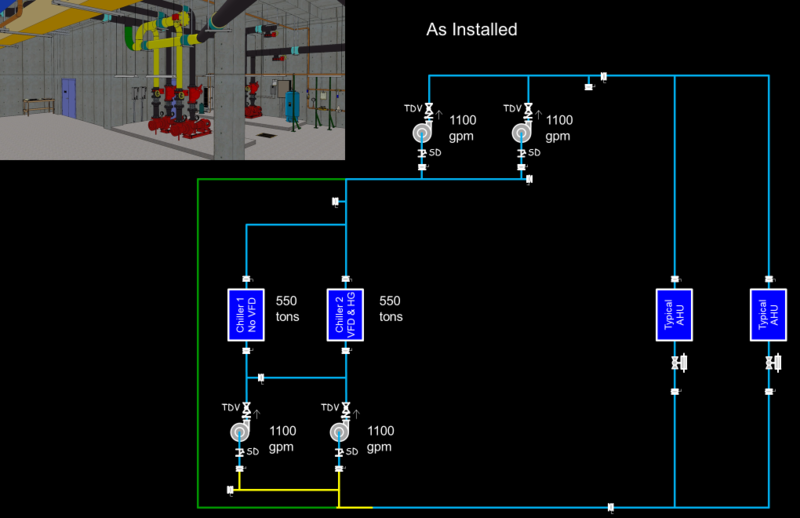 The Variable Flow Chilled Water Plant workshop will rely heavily on interactive exercises using Sketchup Models. To maximize the benefit of attending the workshop, I highly recommend you bring a laptop to the session and download and install the free version of Sketchup (Sketchup Make) if you do not already have it on your laptop. You will find information on how to go about doing that on the Sketchup Models page of this website. With the release of the latest version of SketchUp, the program no longer supports computers with 32 bit operating system in order to fully leverage the graphic capabilities of the current technology. But not everyone has a 64 bit computer. To address that, I have uploaded the install files for a number of older versions of SketchUp on the SketchUp page of the website. A model of a central chilled water plant. A model of the cooling towers serving the plant and the site that the central chilled water plant is located on. A model of an air handling system that is one of the loads on the central chilled water plant. A model of the duct system and area served by the air handling system. ​We will work primarily with the chilled water plant model but will likely also use the others as a part of the class activities depending a bit on where your questions take us. The models have been back-saved as SketcUp version 8 files to ensure they will open with older versions of SketchUp. So they should work with any version of SketchUp from Version 8 forward. If you open them in a newer version, you will get a little warning telling you that the file was created in an older version and that if you save it, it will be converted to the format associated with the version of SketchUp you are running. All you need to do is acknowledge that. What follows are the slides and other materials I used as a framework for the class session. Since the class is, by design, somewhat free-form, I usually have a lot more material on hand than I will actually use. What I use depends on where the interactive discussions take us. So, in what follows, I have included items I had "on deck" to use depending on how the session flowed in addition to information that supports the topics we discussed. I offer all of it as additional information and it is what it is. You can always get in touch with me if you have questions. These are the slides I used as a framework for the class yesterday. Because they were a framework rather than a formal presentation, you will notice that I did not present them in the same order nor did I present all of the slides. Because of color pallets and slide size, the slides are actually spread through a main module and three sub-modules that are linked to the appropriate slides in the main module. Slides 77 - 79 - These take a closer look at the instrumentation we installed to develop the load profile for the Seattle high-rise I was using as an example. I have included the informal pricing documents we used to get the sensors installed in the supplemental information that follows along with a bit more of a description of why I think it is relevant. Slides 80-84 illustrate how we used the data we collected to develop the plant load profile. The spreadsheets behind them are included in the supplemental information that follows along with a few comments on why they are relevant. 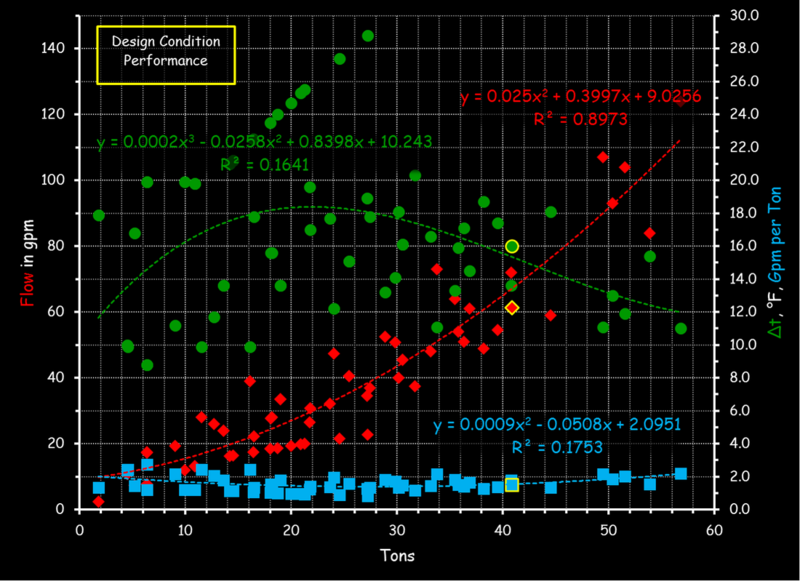 Slide 85 is the kW per ton profile for the plant design plotted against the load profile. The spreadsheet behind that is included below along with a bit more of an explanation about why it is relevant. Slides 86-87 illustrate a technique based on a simple test and basic data loggers that can be used to develop a plant load profile for a plant like the one in the model. 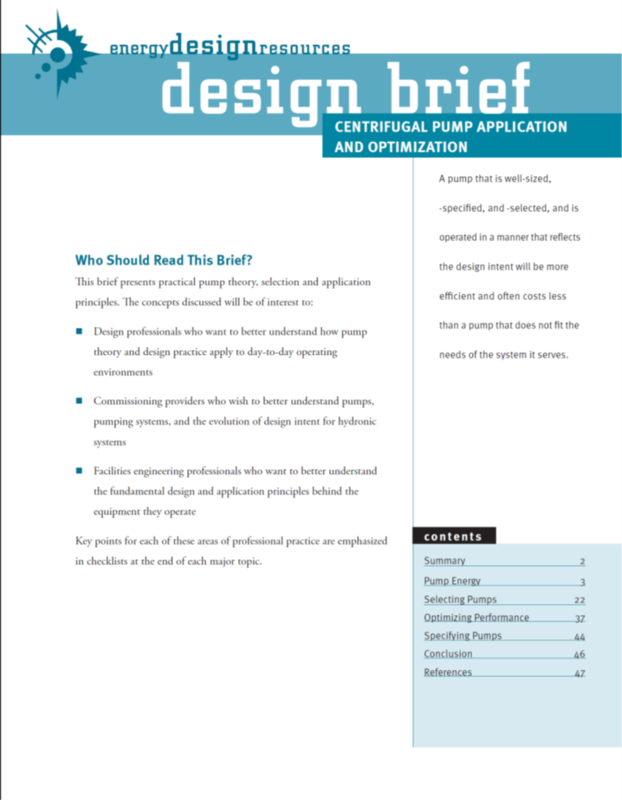 The file below contains the two Energy Design Resources Design Briefs I mentioned on the topic of pumps. If you want to know more about pumps, you may also find the materials from the Pumps; Design, Performance and Commissioning Issues class I present with Ryan Stroupe at the Pacific Energy Center to be of interest. Tabs with the data that create the pump curve (red); the resulting curve was simply copied and used multiple times for the rest of the analysis. Note that the savings calculations have been done for four different locations and how the results vary significantly due to the nature of the climate, the utility rates and the desired plant operating sequence (the pump serves the lead chiller and the result would be different if it served the lag chiller). There are several findings that you could identify in the chiller plant model related to the distribution pumps including throttled triple duty valves, VFDs in hand and at full speed and what seems like a fairly high differential pressure set point for the current operating condition. ​If you looked at the AHU model as being representative of a load on the system at the end of the line, you would discover that the chilled water valve is throttling pretty hard (more closed than open if you climb up the ladder and take a look), even though there is obviously flow through the coil (condensation, pressure drop and temperature change on both sides). You also may have noticed that there is a differential pressure transmitter piped across the pump header at the central plant that appears to be the input to the control process setting the pump speed. As a result, you may conclude that you should investigate some sort of reset schedule that resets the set point of the control process based on what is going on out in the system; basically, leverage the two-thirds rule. If you really dig into that a bit, you will also discover that the distribution pumps are best first cost pumps not best life cycle cost pumps. The original selections were best life cycle cost but were Value Engineered (VEd) out of the project as can be seen from the equipment schedules on the plan table (tab 46 in the model). The spreadsheets in the zip file at the end of this section illustrate the analysis you might do to explore different ways to achieve savings including optimizing the existing pumps via number of ways and upgrading the pumps to more efficient selections and optimizing the speed control for them. The model is base on an actual flow profile from a smaller plant. The results of the analysis are in the Summary tab. 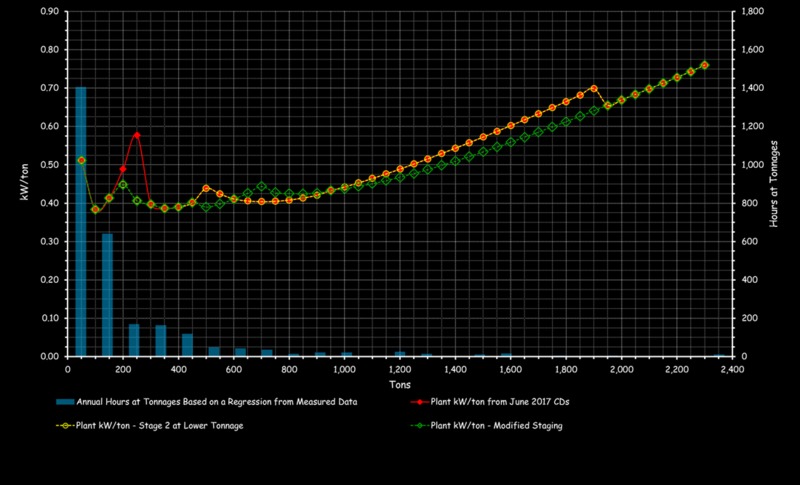 The Data tab takes the original load profile and shifts it based on the plant tonnages. It also calculates the chiller starts and hours that show up on the chiller displays. 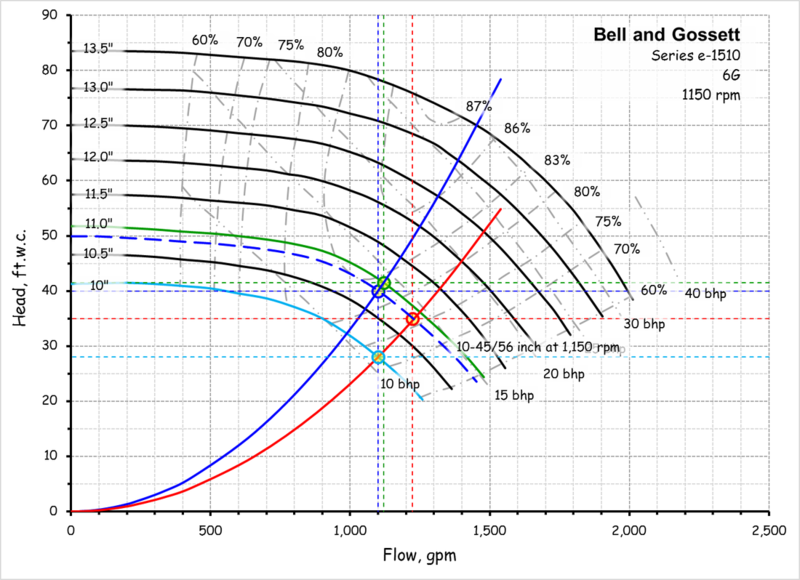 The Flow tab generates the flow profile for the model plant based on the shifted load profile and then calculates the energy savings for a number of ways of controlling the secondary pump differential pressure. Note that using a trim and respond approach applied to the existing pump generates more savings for much less cost than upgrading to a significantly more efficient pump but using a less ideal speed optimization strategy. Of course the most efficient pump plus the trim and respond optimization would yield the most savings if you had the money and the control network would support the traffic required for trim and respond. But the point of the exercise I use this data for is that many times you can get a significant chunk of the ideal savings simply by optimizing a control strategy. These spreadsheets are based on a technique I use to come up with a relationship for pump energy as a function of flow for a given system. I developed it because I concluded that using the SCE affinity law coefficients that are typically used (see the file associated with the Affinity Law Exponents section below) would tend to over-state the savings if the plant had a lot of part load hours. The reason I concluded this is that those coefficients will project that the pump energy at 0 gpm is 0 kW, which is not the case for a real world pump; just think about dead-heading a pump. The flow is in fact forced to 0 gpm, but the pump, of course, is still spinning and drawing power. How important this distinction is will depend on how many part load hours the plant has and the tonnage at those part load hours. If the plant runs fully loaded most of the time, it is not as critical as if the plant spent a lot of hours at part load. But there are quite a few plants that have a significant number of their hours at low load conditions. For example, I was just working with a team on a 700 ton plant that spent 90% of its time at or below 200 tons and 80% of its time at or below 140 tons. Estimate the pressure drop from the pump location to the point in your system where you are measuring and maintaining a fixed pressure. The technique assumes your control process will hold a fixed pressure at some point in the system. So that pressure will never vary but the pressure drop from the pump to that location and back will vary as the square of the flow. Reduce the flow rate by some arbitrary amount. I usually do 75%, 50%, 25% and 12.5%. The more points, the better the curve fit when you project the flow vs. pump energy line so this is a trade off between curve fit and engineering time to develop it. Calculate the head required at this new flow rate based on the fixed head you will maintain at the sensor location and the portion of the design head that will vary with flow in the piping between the pumps and the sensor location. Use the square law to project a system curve through this point and read the efficiency where it crosses the design impeller line. 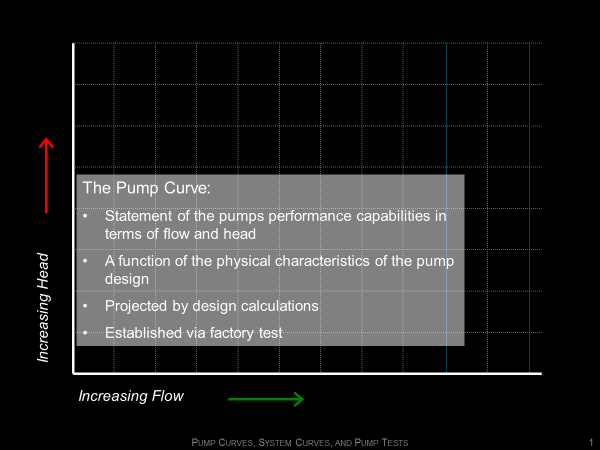 This is the efficiency you will use in your pump power calculation at the reduced speed since reducing the pump speed moves you up and down a system curve and preserves the pump efficiency. Plot your data points as pump power (y) vs. flow (x) and use the Excel trendline feature to develop an equation that lets you calculate the pump power for a given flow condition (black tabs in the spreadsheet). 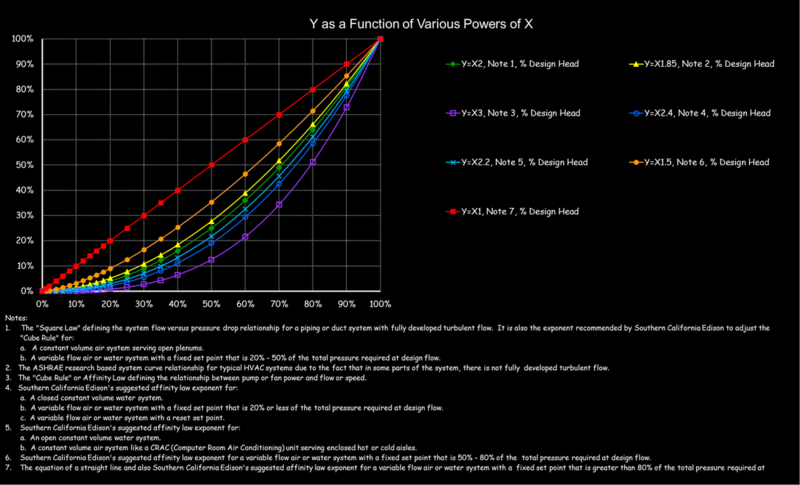 ​The Affinity Laws Speed - Case 1 Details v2.pptx file illustrates these steps. The summary tab of the Bhp vs Flow 1510 5E 1750 rpm Remote DP.xlsx spreadsheet compares the results associated with the analysis in that spreadsheet with the results from the other options on the summary tab starting at line 41. These spreadsheets are the cost projections associated with each of the options I looked at for optimizing the distribution pumps in the central plant. 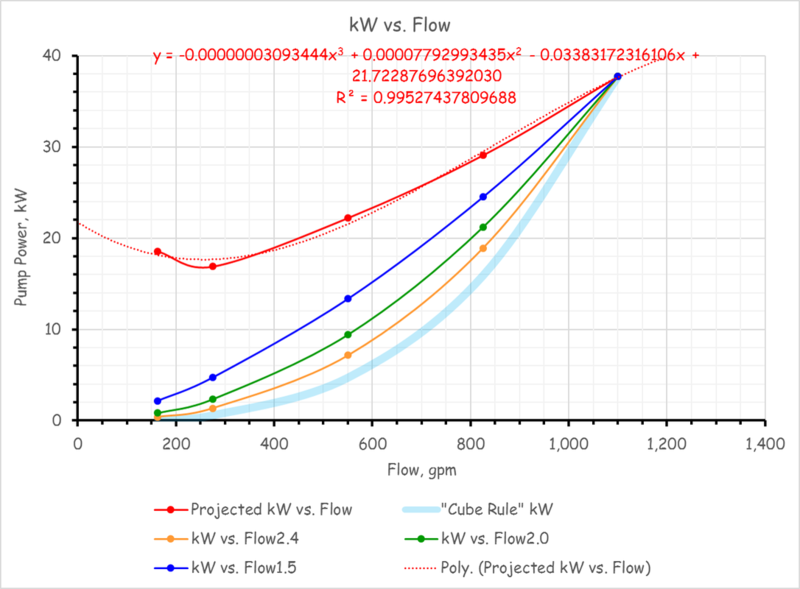 The affinity laws state that pump energy varies as the cube of the flow rate and there is a temptation to calculate pump and fan power for variable flow systems based on this relationship. However, the relationship is based on a fixed system curve and variable flow systems actually operate on a family of system curves. In other words, every time a valve or damper moves, it establishes a new system curve. So the power consumption for the system will approach the cubic relationship but not match it. At one point, Southern California Edison funded some research to establish exponents that could be used to project pump energy savings for different sensor locations in a variable flow system. But those exponents will tend to overstate the savings if a plant spends a lot of time at part load, as I mentioned above. The zip file below includes a spreadsheet that compares the various SCE exponents and has a tool in it that helps you estimate an appropriate exponent for your system from the SCE data based on the design operating pressure for your system and the pressure you will maintain at the controlling sensor location using a variable speed drive. It also includes the original SCE technical bulletin that published the exponents and recommendations on how to apply them. I used the Davis Hall condenser water system to illustrate how the variation in head requirement that occurs at different flow rates in systems with long runs of common piping can cause a constant flow system to actually be a variable flow system. ​The zip file to the right contains the model I used along with the system diagram and a presentation I use that illustrates the results of the testing we did on the system that documented the issue. One of the things I had "up my sleeve" that we did not get to in the class was the impact of flow variation over a tower on its performance. It turns out that if you reduce the flow too much for a given tower, then you will no longer wet all of the tower fill. If you don't wet all of the tower fill, air will short circuit around the fill since it is easier for the air to pass through the dry fill relative to the wet fill. If that happens, then the near linear relationship between tower fan energy and heat rejection is broken and the tower will use more energy that you expected for a given load condition. You can also start to deposit scale on the tower fill, even if the water quality is good, because on some of the fill, all of the water evaporates before it reaches the cold basin. The reason this matters is that in the drive for energy savings we are implementing measures that will cause flow to vary over the towers. 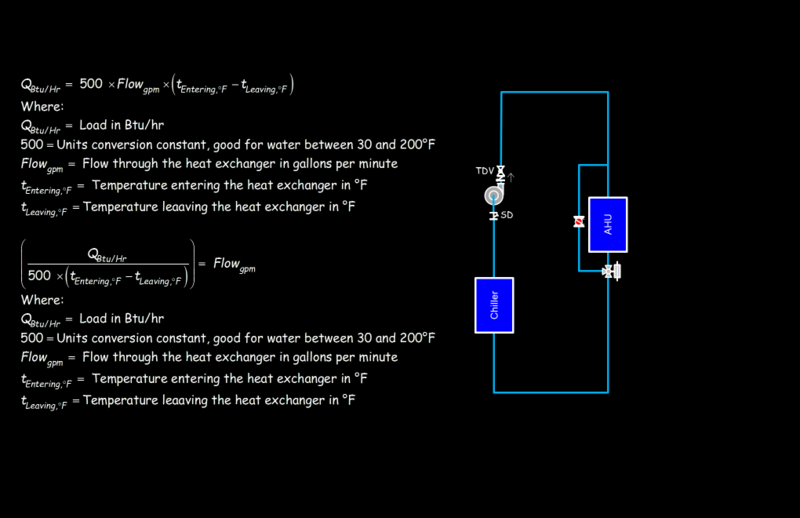 Two common examples are varying flow to manage head pressure, which was mentioned during the class, and opening more cells than you might need for the current load condition to spread the flow out and leverage the cube rule to save fan energy. Both of these approaches will in fact save energy, but only if the tower performance is not degraded by poor flow distribution over the fill. I am about to publish a blog post that illustrates this and provides video clips that show the phenomenon happening in a number of towers. So rather than try to include that information here, I will suggest that you watch for that information to show up on my blog and on the videos page of the website. I am still working to get the supporting materials content on the site. I decided to put some explanatory notes in for each of the files so you would better understand what it represents and that its taking a bit of time. I will be attending sessions at the conference a lot today but will work on it during breaks and this evening and ultimately hope to finish by tomorrow evening if not sooner. We discussed Low Delta-T Syndrome or the "Death Spiral" in class a bit. In fact, if you look at what is going on in the plant in the model, it is in early Low Delta-T Syndrome; the supply and return temperatures to/from the loads are identical to the supply and return temperatures at the active chiller. That means that the flow to the system is nearly the same as the flow through the chiller (1,100 gpm based on the evaporator pump nameplate if you assume the discharge valve was throttled to deliver design flow). ​But, if the load on the plant is in the 250 - 350 ton range based on the various clues about that in the plant (its about 330 tons if you assume 1,100 gpm through the evaporator and that the temperature transmitters are accurate), and if its a 12°F delta t plant (550 ton chillers with 1,100 gpm flowing in the evaporator) then the actual system delta t of 7°F is low relative to the 12°F design condition. The primary reason for the lower than design temperature rise on the system side in this case is the performance of the cooling coils with non-design entering air conditions; they simply can not generate the design temperature rise with cooler, dryer air entering them. The file below is just data from a plant that was in low delta-t syndrome for a number of days during the logging interval so you can see what that looks like in a real world situation. The plant was an nominal 2,400 ton, 16°F delta t plant serving a high rise office building in Seattle. We discussed how much cooling coil performance can vary with load conditions during class. As we saw, that works against the theoretical constant system temperature rise that is implied by a variable flow plant design. The implication is that by design, variable flow plants will drive into low delta-t syndrome unless the plant design takes the phenomenon into account. The files below are the Greehheck coil models I used to generate the data I presented along with the Excel file that contains the data and generated the chart to the right. During class, we discussed how important it is to understand the seasonal and daily load profile on the plant and then tailor the selection and operation of the equipment to that in addition to being able to meet the design load on the design day. The spreadsheets in the zip file below are associated with an analysis of a plant that was being designed to replace an aging plant in the high-rise that the low delta t syndrome data is from. In the image above the building load profile is represented by the blue bars. The load profile was developed from measured data from the building; i.e. the building told us the load profile it sees. In this particular case, note how the plant actually can see hours at 2,400 tons but spends the majority of its time at or below 400-600 tons. Based on this, the new plant was configured to include a 300 ton modular chiller and two 1,000 ton modular chillers. If the plant had been staged per the design sequence, the kW per ton profile would have looked like the red line because the original sequence ran the small chiller up to the point where it was nearly fully loaded before staging on a larger chiller. Intuitively, that seems correct, but when you look at the chiller compressor kW per ton profile, you discover that the larger machine is actually more efficient than the smaller chiller at around 130 tons. If you take the condenser pump energy into account (the next largest component contributing to the over-all kW per ton profile) the larger machine is more efficient than the smaller machine at around 190 tons. By staging the larger chiller on sooner, the kW per ton curve for the plant is shifted from the red line to the yellow line, improving the over-all efficiency at a point where a lot of operating hours will occur. A similar analysis suggested that staging the small machine back on as the second chiller instead of the larger machine would improve the over-all plant efficiency (the green line). The point of all of this in the context of the class and existing building commissioning is that extracting the building load profile from actual building operating data and developing the plant kW per ton profile based on the characteristics of the installed equipment (or the proposed equipment in the case of a new plant) and then overlaying those to profiles can provide powerful insights into the best way to operate the plant. Frequently, improvements can be achieved by simply modifying the plant sequencing strategy. The files in the zip file below are the files behind the chart at the beginning of this section. If you open them, they will probably seem complex. But if you take them one tab and one row at a time, I think you will discover that they are not as complex as they seem. The idea is to show you the techniques I use so you can revers engineer them and replicate the ideas on your own. 2016-07-05 Tons vs. OAT Tool v2.xlsx takes the logged data from the plant and generates the regression that projects plant tons as a function of outdoor temperature. Load Profile Generator v3.xlsx takes the data from 2016-07-05 Tons vs. OAT Tool v2.xlsx and develops the load profile for the plant. 2016-06 CD kW per Ton v5 - 01 Per Sequence.xlsx develops the plant kW per ton profile and overlays it on the load profile. The chart at the beginning of this section comes from this spreadsheet. Sensor Addition Drawings v4.pdf is the informal contract document we used to get the sensors in place to develop the building load profile. 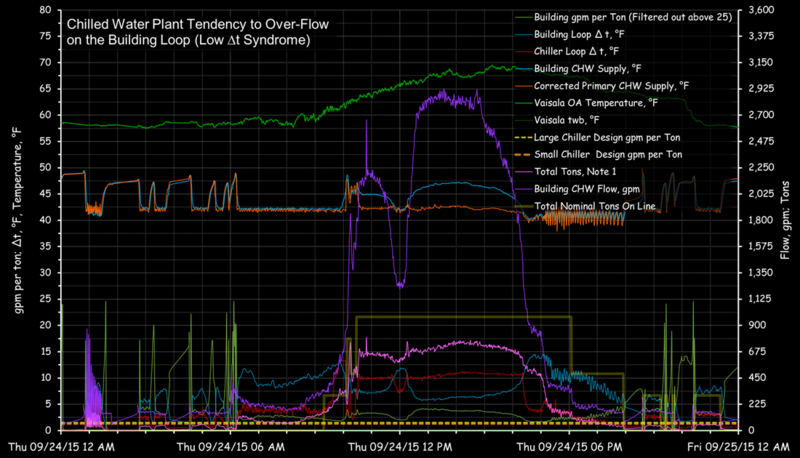 Note that we only needed the system temperatures and flows to develop the load profile. The other sensors were installed so we could develop energy savings projections for the new plant relative to the existing plant. These are the materials associated with a presentation I did about writing a functional test for an EBCx/MBCx project. The presentation centers around a case study of the chilled water system in Le Conte Hall at UC Berkeley. The system had a short cycling problem related to a new research load that was added and by using a functional test to ask the building about the dynamics of the load, we were able to learn enough to develop a flywheel cycle that solved the problem. The fix also allowed us to save energy via implementing an integrated economizer cycle on an air handling system that up to that time, used a non-integrated economizer cycle to prevent short cycling of the compressor in the air cooled chiller serving the system. Filtration is an essential element of any HVAC process with some sort of filter found in virtually all AHUs. When one considers that at least one 2’ x 2’ filter will be required for every 2,000 to 4,000 square feet of building area and that CBECs data suggests that there are 58,800,000,000 square feet of commercial building space, then the number of filters associated with commercial HVAC systems is astounding. These figures do not include health care and process facilities, where filtration requirements are more stringent and multiple filter banks are common. The operating cost for a given filter bank includes a first cost associated with the cost to procure/install the new filters and remove/dispose of the old filters. This tends to decline with time in service. ... will all likely impact the type and quantity of contaminants handled by the system, one will conclude that there is more than time in service to consider when contemplating the best time to replace filters for a given HVAC system. This presentation uses a case study approach to discuss and explore operating filters on a life cycle cost basis v.s. time in service. The presentation will include data from systems where alternative technologies were operated side by side in identical systems over a period of years while data was logged on a 15 minute basis to allow the alternative approaches to be contrasted. In one example, the more costly, best life cycle cost technology with a projected 42 – 48 month best life cycle cost took two years to reach the pressure drop associated with the alternative, legacy technology. In another case study, the more costly, lower life cycle cost approach exceeded the 42 month best life cycle cost projected by the model that drove the decision to try it out. One of the keys to success with this approach is to recognize that filters with identical MERV ratings can have radically different performance characteristics. Typically, more highly engineered media, while having a higher first cost, will provide lower initial pressure drops, flatter pressure drop vs. dust load curves, and higher dust holding capacity relative to the lowest first cost technology. ​As a result, the higher first cost technology often represents the best life cycle cost, saving fan energy, installation labor, and filter first cost and disposal cost (i.e. less to the landfill) making life cycle cost based filter operation attractive from a sustainable operations standpoint. 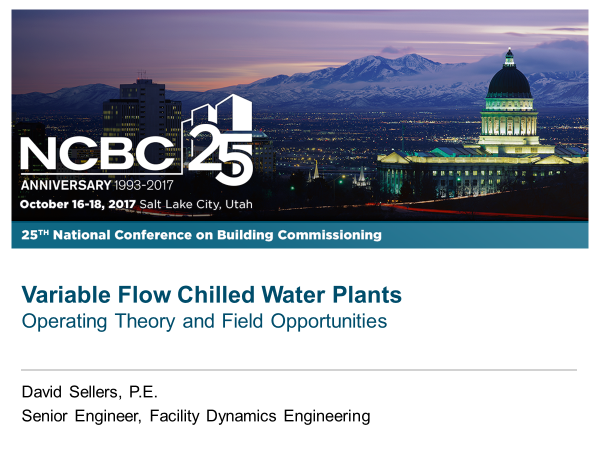 The download to the left is the PowerPoint presentation associated with this topic from NCBC 2017. The download to the right is a paper I published with Mike Chimack at ACEEE 2000 that is a case study of applying the concept in an operating facility. You will also find a number of posts on my blog that cover the topic starting with a post titled Demonstrating HVAC Filtration Savings with Data Loggers. 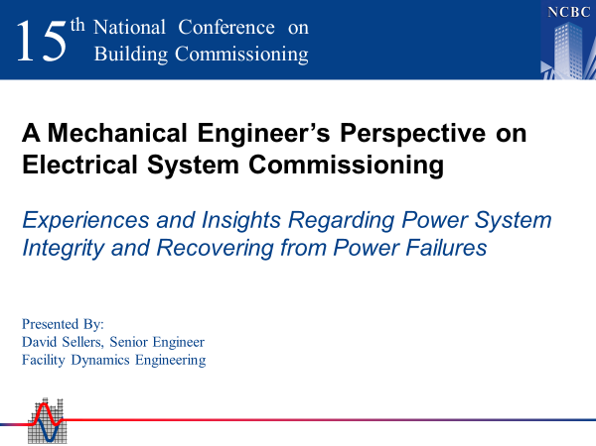 This is a presentation I did for NCBC about my perspectives as a mechanical engineer on power failure and recovery from power failure. An unexpected power failure and the ensuing recovery can wreak havoc on a building and its systems, generating complaints, loss of environmental control, quality control problems, and occasionally, debris. This presentation uses a case study format to illustrate and discuss important HVAC and building system considerations that should be targeted when assessing and testing the ability of a building and its system to recover from a loss of electrical power as well as other utilities. At the time I did the presentation, I had just helped PECI write the Integrated Operation and Control and Power Failure Recovery section of the Functional Testing Guide. (Note that the Power Failure Recovery link downloads the Word document vs. opening a new window). The guide is still up and running but given the age of the HTML, it will run better in Windows Explorer than the current browser assortment. I personally run it under Windows Explorer 11 and turn on compatibility mode.